Will Congress Authorize Indefinite Detention of Americans? Under the guise of exercising supervisory power over the president’s ability to use military force, Congress is considering writing Donald Trump a blank check to indefinitely detain US citizens with no criminal charges. Alarmingly, this legislation could permit the president to lock up Americans who dissent against US military policy. The bill that risks conveying this power to the president is the broad new Authorization for Use of Military Force (AUMF), S.J.Res.59, that is pending in Congress. 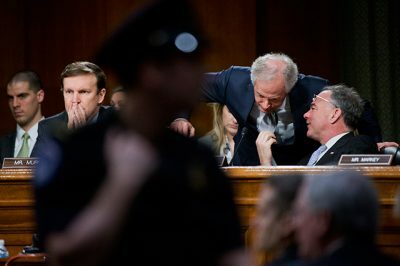 Senate Foreign Relations Committee chair Bob Corker (R-Tennessee) and Democratic committee member Tim Kaine (Virginia) introduced the bipartisan bill on April 16, and it has four additional co-sponsors. This proposed 2018 AUMF would replace the 2001 AUMF that Congress gave George W. Bush after the September 11 attacks. Although the 2001 AUMF authorized the president to use “all necessary and appropriate force” only against individuals and groups responsible for the 9/11 attacks, three presidents have relied on it to justify at least 37 military operations in 14 countries, many of them unrelated to 9/11. But the 2018 AUMF would codify presidential power to make war whenever and wherever he chooses. S.J.Res.59 allows the president “to use all necessary and appropriate force” against Iraq, Afghanistan, Syria, Yemen, Libya and Somalia, al-Qaeda, ISIS (also known as Daesh), the Taliban and their “associated forces” anywhere in the world, without limitation. However, the bill contains no definition of “co-belligerent.” A president may conceivably claim that a US citizen who writes, speaks out or demonstrates against US military action is a “co-belligerent” and lock him or her up indefinitely without charge. Under the new AUMF, the president could tell Congress he wants to use force against additional countries or “associated forces” that are not listed in the bill. It would put the burden on Congress to say no by a two-thirds vote, a virtually impossible margin to achieve in the current political climate. The International Covenant on Civil and Political Rights — a treaty the United States has ratified, making it part of US law under the Constitution’s Supremacy Clause — forbids arbitrary detention without charge. The Court also stated that US citizens held as enemy combatants must be provided due process to contest the factual basis for their detention before a neutral decision maker. The Supreme Court has not ruled on whether a US citizen who is apprehended in the United States can be detained indefinitely. It declined to decide the case of José Padilla, who was arrested at Chicago’s O’Hare International Airport in 2002 and held in military custody as an enemy combatant by the Bush administration, relying on the 2001 AUMF. The Court ruled that Padilla’s habeas corpus petition was mistakenly filed in New York instead of South Carolina. Criminal charges were eventually brought against Padilla in 2005. He had been held in isolation for more than three years and tortured while in custody. Padilla was tried and convicted in 2007 of conspiracy charges and providing material support to terrorism, and sentenced to 17 years imprisonment. In 2014, his sentence was increased to 21 years. Meanwhile, the Fourth Circuit and the Second Circuit US Courts of Appeal came to opposite conclusions about whether an American citizen apprehended on US soil could be held indefinitely as an enemy combatant. “John Doe” is another American citizen detained by the US government. In September 2017, the US-Saudi citizen was named an enemy combatant for allegedly fighting for ISIS and has been held in military custody in Iraq ever since. Although the 2001 AUMF never mentioned ISIS, the government used it as a basis to detain Doe. In April, the Department of Defense attempted to transfer Doe to Saudi Arabia and avoid a judicial ruling in the case, but a federal judge in Doe v. Mattis blocked the move. It is not clear how passage of the proposed 2018 AUMF would affect Doe’s case. Does Defense Authorization Act Permit Indefinite Detention? An AUMF is an Act of Congress. Another Act of Congress is the National Defense Authorization Act for fiscal year 2012 (NDAA). Relying on the 2001 AUMF, the 2012 NDAA purported to codify the president’s authority to hold US citizens in military custody indefinitely. Obama’s statement implied that while a president does have the power to indefinitely detain Americans, he chose not to exercise that power. Noam Chomsky, Daniel Ellsberg, Chris Hedges and other journalists and human rights activists sued the US government, claiming the 2012 NDAA would have a chilling effect on their freedom of speech because they could be arrested. A federal district court judge found section 1021(b)(2) unconstitutional and issued a permanent injunction prohibiting the government from relying on it. Nothing in the 2018 AUMF would prevent the president from adding an American organization or individual to the list set forth in the bill, according to Christopher Anders of the ACLU. The 2018 AUMF has no expiration date. Every four years, the president would be required to give Congress a proposal to repeal, modify or maintain the authorization. Once again, it puts the onus on Congress, by a two-thirds majority, to take contrary action. S.J.Res.59 may not make it to the floor of the Senate and/or the House. Congress has thus far resisted enacting a new AUMF that could be seen in any way to limit the president’s military authority. Ironically, however, the enactment of this new 2018 AUMF could both enshrine the president’s unlimited power to wage war and also provide the president with a basis for indefinitely detaining US citizens in military custody without criminal charges. If this bill were to pass, it would imperil our right to speak out and challenge whatever military adventures the president decides to undertake. Marjorie Cohn is professor emerita at Thomas Jefferson School of Law, former president of the National Lawyers Guild, deputy secretary general of the International Association of Democratic Lawyers and an advisory board member of Veterans for Peace. The second, updated edition of her book, Drones and Targeted Killing: Legal, Moral, and Geopolitical Issues, was published in November. Visit her website: MarjorieCohn.com. Follow her on Twitter: @MarjorieCohn. Cohn is a frequent conrtibutor to Global Research.